Replies: 934 (Who? ), Viewed: 208004 times. #1 8th Feb 2012 at 12:50 AM Last edited by justJones : 7th Feb 2014 at 3:51 PM. I'm currently playtesting this challenge myself, so I may still modify the rules slightly and refine a few things - especially since I'm still new to last two expansion packs. But I thought that I'd post this now because I'm having a blast and I think it's probably good enough to share already, and I'd like to see what other people think of it. I originally got the idea for this challenge because I was a big fan of the Build A City challenge from the Sims 2. I saw that challenge had been updated for the Sims 3, but I think that the different gameplay found in the Sims 3 really doesn't mesh well with it. So this is more "inspired by" than anything, as I may have started with that but I simplified the rules and took it a different direction. 1. You need a completely empty world. Lots can be laid out if you want, but none of them may be built upon at all and any community lots must be set to "No Visitors Allowed". How you obtain such a world, whether you empty out one of the premade ones or whether you have a custom one does not matter. I only draw the line at worlds that have a bajillion spawners for rare stuff all over the place - let's keep it reasonable, okay? But it cannot have a single rabbithole, park, or anything like that - it must be empty. There also may not be any Sims living in this world. 2. You may make 1 CAS Sim in this world, and 1 only. You are never allowed to make any other CAS Sims. Gender, exact age, etc. are all up to you. Pets may not be created with them. 3. Move this Sim into an empty lot in your empty world, and that starts your challenge. You're also going to have a hard time finding mates for your first few generations. I suggest hanging out by the mailbox, ordering pizza, or hiring a maid and hope someone of the appropriate gender shows up. (My Sim got robbed and married the burglar...) Kids may be biological, adopted, or created in some fashion - none of that is restricted. - First, if you want to move a Sim out of your household and into a new one you may build a new house on condition that they immediately purchase it and move into it. This means that they need to be able to afford it, of course. - Secondly, you may move your current household into a new lot and build them a new home there, provided that at least one Sim is left behind to occupy the old house. 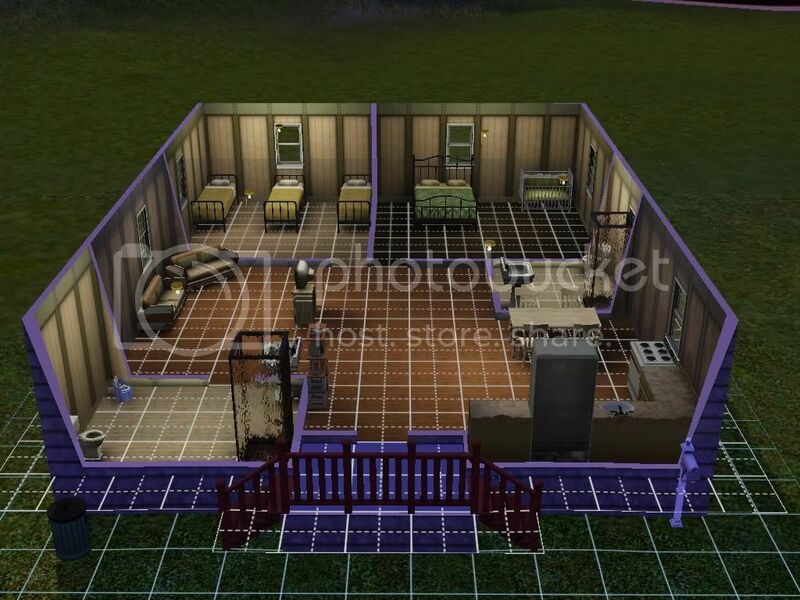 - In all cases, you may not shortchange a Sim by giving them anything less than a fully furnished home (though it doesn't have to be spectacular - you can give them a small trailer home, but it has to be something they can actually live in). The current household you're playing is an exception since you're actually going to have to put up with it, so if you want them to live out on the lawn that's fine, but until you fix that you can't switch households. - Your current household may purchase additional homes, but these may not be sold unless you either bulldoze everything first or immediately have a member of the current household move into that lot. City Hall - Maxed Charisma (no money requirement). Graveyard - Must purchase the lot (no skill requirement). Military Base - Maxed Handiness and Athletics (no money requirement). Police Department - Maxed Logic, Athletics, and Painting (no money requirement). School - Maxed Charisma and Logic (no money requirement). Art Gallery - Maxed Painting, and must purchase the lot. Beach - Maxed Athletics or Scuba Diving, and must purchase the lot. Big Park - Maxed Logic and Gardening, and must purchase the lot. Fishing Spot - Maxed Fishing, and must purchase the lot. Gym - Maxed Athletics, and must purchase the lot. Library - Maxed Writing, and must purchase the lot. Pool - Maxed Athletics, and must purchase the lot. Small Park - Maxed Gardening (no money requirement). Visitors Allowed - No requirements, see Rule #5. No Visitors Allowed - No requirements, see Rule #5. Academy - Maxed Martial Arts, and must purchase the lot. Chinese Garden - Maxed Photography, and must purchase the lot. Nectary - Maxed Nectar Making, and must purchase the lot. Consignment Shop - Maxed Sculpting, and must purchase the lot. Fire Station - Maxed Athletics and Handiness (no money requirement). Hangout - Maxed Charisma (or Mixology if you have Late Night), and must purchase the lot. Junkyard (regular or no visitors) - Maxed Inventing (no money requirement). Laundromat - Must purchase the lot (no skill requirement). Salon - Maxed Painting (no money requirement). City Hall/Police Station/Military Combo - Maxed Charisma, Logic, Athletics, Painting, and Handiness (no money requirement). Clubs (Disco, Dance, or Poolside) - Max any instrument, at least One Star Celebrity Status, and must purchase the lot. Bar (Sports, Local Watering Hole, Dive) - Maxed Mixology, and must purchase the lot. Lounge (Fusion, Vampire, Exclusive) - Maxed Charisma, at least Three Star Celebrity Status, and must purchase the lot. See Supernatural Other Lots for another way to earn a Vampire Lounge. School/Stadium Combo - Maxed Charisma, Logic, and Athletics (no money requirement). Cat Jungle - Must complete the Cat Herder Lifetime Wish, and must purchase the lot. Dog Park - Must complete the Canine Companion Lifetime Wish, and must purchase the lot. Horse Ranch - Must complete the Jockey Lifetime Wish, and must purchase the lot. Coffeehouse - Must earn a Big Park with a stage first, and reach Level 10 in any performance career (no money requirement). Live Show Venue - Must earn a Coffeehouse first, reach Level 10 in any performance career, and must purchase the lot. Private Venue - Must earn a Live Show Venue first, reach Level 10 in any performance career, and must purchase the lot. Big Show Venue - Must earn a Private Venue first, and reach Level 10 in any performance career (no money requirement). Arboretum - Maxed Gardening, and Sim must be a fairy (no money requirement). Elixer consignment store - Maxed Alchemy, and must purchase the lot. Supernatural hangout - Maxed Charisma (or Mixology if you have Late Night), must be a supernatural being of some sort, and must purchase the lot. Vampire Lounge - Maxed Charisma, Sim earning the lot must be a vampire, and must purchase the lot. See Late Night Other Lots for another way to earn it with that expansion. Festival grounds - Maxed Cooking and Athletics (no money requirement). Arcade - Max Jock Group and must purchase the lot. Java Hut - Max Gardening and Cooking and must purchase the lot. Nerd Shop - Max Nerd Group and must purchase the lot. Rebel Hangout - Max Rebel Group and must purchase the lot. Student Union - Max all three Social Groups (no money requirement). University Hangout - Maxed Charisma and must purchase the lot. Resort - Maxed Charisma and must purchase the lot. Port - No requirements, see Rule #5 and Rule #19. Diving Area - Maxed Scuba Diving (no money requirement). Bot Emporium - Maxed Bot Building, and must purchase the lot. Cafeteria - Maxed Advanced Technology, and must purchase the lot. Gallery Shop - Maxed Advanced Technology, and must purchase the lot. Business Park - Must earn a Legacy Statue, and must purchase the lot. Wasteland - Maxed Bot Building (no money requirement). Future Lounge - Maxed Charisma, must earn a Legacy Statue, and must purchase the lot. Dried Up Beach - Maxed Laser Rhythm (no money requirement). 1. Aging may be set however you like as long as you don't touch it after you've started - this challenge tends to punish you for setting it too long by making it take forever, and for making it too short by making meeting the requirements difficult. Keeping it at default or around there seems perfect for me. Also, story progression should be on. 2. This challenge has no scoring system and no definite end point. However, once you reach the point where your city is pretty much completely built up, you can declare yourself victorious. And if the city you end up with is better than someone else's, you can consider yourself even more victorious than they are. Of course, that's all subjective. 3. No cheating! Especially by doing anything that helps with skilling and money - that's kind of the whole point of the thing. Generally speaking, mods/objects that make your game run better are okay, while mods/objects that make actually playing the game easier are not. Fixing bugs is never considered cheating - do what you have to in order to save your game. See below for a list of mods that people have asked about and my response. All mods that actually make it harder are always allowed. 4. When using Edit Town mode, you are not allowed to build any residences your Sim isn't immediately going to purchase or change the designation of any community lot from "No Visitors Allowed" unless it's about to be purchased or has been otherwise earned. See below for more specific rules on moving Sims around. 5. You may not abuse lots you don't have to buy by putting fancy skilling or mood boosting objects there so that your Sims don't have to buy them at home are not. Landscaping, tables and benches, that sort of thing is fine. Hot Tubs and grand pianos are not. Rabbithole lots should mainly be the rabbithole and landscaping. "Visitors Allowed" and "No Visitors Allowed" lots should be used sparingly and only for places without much in them (a lot that's merely a fancy pedestrian walkway or a subway station would be good examples). Small parks should be just that - if you can fish there then it's a fishing spot, and if it has skilling objects like chess tables it's a big park. The only non-decorative objects in Salons and Junkyards besides what you're there for (stylist and tattoo stations for the former, scrap piles and junk in the latter) is maybe a bathroom. Fire Stations need to be more fully outfitted to keep everyone working there happy, but I think you get the picture: be reasonable. 6. It's always acceptable to use mods or cheats whose effect is purely cosmetic (i.e. they make something look different but don't actually effect anything). When building you may use any fancy cheat codes to make it look nice you want, for both residential areas and community lots. You may also use buydebug to place things you need from there to make your lots fully functional - including spawners if you want to be able to, say, fish for Deathfish in the graveyard. But you may not abuse this by, for example, making a lot full of rare spawners just to make finding the good stuff easy. You may also edit the appearance of Sims and pets using mods to give them a particular appearance, or change their name and such. What you may not do is edit things like their traits and skills. 7. Each Sim may only earn 1 community lot for you. So if your Sim has maxed Cooking and has $61,500, then you may not get both the Diner and the Bistro - you'd need a second Sim to max Cooking to get both. And it must be the same Sim - if you have one Sim max Handiness and another max Athletics, you have not earned a Military Base. Also, lots that don't require any skills must still be earned by a specific Sim (and purchased with their household's money), and you may not change your mind about which one did it. 8. Your Sim may not sell any of the lots that they purchase. For any buyable venue, you may only edit it through the real estate system unless you're fixing a bug. If a venue becomes unowned due to Sims dying or whatever, another Sim must purchase it so that you can edit it using their money instead of the unending supply you get in Edit Town mode. 9. You may freely switch households whenever you want, provided that the household you're leaving behind is fully furnished. "Fully furnished" means that they've at least got a functional kitchen, bathroom, and enough beds for all the Sims living in it all enclosed by walls with flooring and wall coverings - you know, an actual house. Doesn't have to be a spectacular one. Though if every residence in your city is terrible then your city is terrible - see rule #2. 11. If you have World Adventures, any Sims who go on vacation are disqualified from earning any community lots. Sims who have already earned a community lot for you suffer no penalties. 13. If you have Generations, it's acceptable to make a child's imaginary friend real, and boarding schools are fully allowed. The inheritance reward is not okay - in fact it's the only lifetime reward that is not okay. Daycares are allowed with you have a City Hall. 14. All things Pets are allowed. 15. If you have Showtime, The Dusty Old Lamp is allowed, but you may not wish for money. A stage may be added to any normally earned Big Park. Stages may be included in any other lot, but the Sim earning the lot must be a level 10 performer in addition to the other requirements. Acrobat, Magician, and Singer are allowed when you have a Big Park with a stage. 16. If you have Supernatural, your starting Sim must start as a human (but a little alchemy can fix that problem). Similar to aging, you can set the moon to do whatever you want as long as you set it and leave it there. 17. If you have Seasons, you can set up the weather however you want as long as you set it and leave it there. 18. If you have University Life, any Sims who go to the university are disqualified from earning any community lots. Sims who have already earned a community lot for you suffer no penalties. Roommates are allowed, but at minimum they must be assigned their own bed. And if you lock them out of part of the house, they must be granted a similar space of their own. For example, if you lock them out of your private bathroom, then they must be provided with a private bathroom of their own. 19. If you have Island Paradise, Ports do not have to be earned but shouldn't contain anything beyond the port itself, mooring places, bike racks, parking spaces, and minor decor and landscaping. Houseboats have the same rules as regular houses. Lifeguards are allowed when you have a City Hall and at least one beach. 20. If you have Into the Future, only Sims who have maxed Logic or Science and Handiness or Inventing may travel into the future. This does not count as earning a lot, and traveling into the future does not disqualify a Sim from earning a lot. However, the sonic shower, food synthesizer, drink synthesizer, retail display pedestals, dream pod, holo-computer, holo-disc, jetpack, and windcarver can only be purchased in the present if there is a Sim in the current household who has both been to the future and has maxed Advanced Technology. (Technically, you shouldn't let your Sims buy anything that looks like it's from the future in the present until that point, but the rest of the stuff is pretty much cosmetic so I won't make that a rule.) If you instead have a Sim who has been to the future but has not yet maxed Advanced Technology, they may bring these things back with them from the future but can't buy more in the present. If you instead have a Sim who has maxed Advanced Technology but hasn't been to the future yet, then you may only buy more of whichever items your household already has. The rules for the Laser Rhythm-a-con and bot workshop are the same as the ones for the above items except that their respective skills are required rather than Advanced Technology. 1. Sims may only be moved into a household using the social interaction and not by using Edit Town or a mod unless you're experiencing a bug or something like that. 2. If the Sim you're moving in is an NPC, you can't keep the $20,000 they bring with them. The money must be wasted in some way, such as with the familyfunds cheat. On the other hand, if they're a Sim living in another household in the city or currently homeless (i.e. a "townie") then you may accept whatever money they bring with them when they move in. 3. Sims may only be moved out of a household using their phone or computer, and not by using Edit Town mode unless you have a mod that eliminates getting extra money from the process. All Sims that are moved out no matter which method you use must be provided a home by you - you may not use the 'kick out' option or leave Sims on the clipboard if you're using Edit Town. 4. You may not move an entire family from one lot to another - at least one family member must be left to live in their old house. Similarly, you may not ask a Sim who is living alone (besides NPCs or the homeless) to move in with you. (An easy way to tell the difference is if the dialog box is indicating that their home will be sold and such.) The best way to solve this is by having someone move in with that Sim. In situations where fixing that is impossible (like I know there are some Sims living alone in the WA locations), you may still move them in with you provided that you treat them like an NPC and waste whatever money they bring in with them. Story progression may cause vacant homes or homeless Sims, but you may not. Those allowing more than 8 Sims in a household - Okay! Those modifying the way money is divided when Sims move in/out - Okay! Story progression mods - Okay! First cousin marriage - Not Okay! 2. If you discover any way to make insane amounts of money really fast that isn't mentioned in the rules and are therefore becoming Bored and are finding this Unchallenging, you may at any time use a cheat code to reduce your household's funds to a sane number and then either limit or ban yourself from making money that way again. Problem solved! As I know many people playing this also play the Random Legacy, I decided to explain how it might be combined. - This challenge would most likely take a lot longer to complete than a single Random Legacy, especially since playing by these rules will slow down the process of earning lots, so you may play a legacy and continue normally, play legacies back to back, or start off normally and then add in a legacy later. - If you do not have a lot required for a Sim's career, for either the Primary Income or Secondary Income, have that Sim earn the required lot. If doing so would be impossible or close enough to it that you don't want that degree of difficulty, you may have them earn an easier lot that would help future generations earn that lot. All Sims unable to work their rolled careers may earn an income by selecting an alternative income type related to what they're earning. Example: Your first generation Sim rolls Science for primary income, but also 5 kids and you just know you're not going to have enough money. Your Sim could earn a grocery store, fishing spot, big park, or other similar lot, and make their money by gardening, fishing, or doing freelance science respectively. - Sims who can do their rolled career may earn a lot of your choice. Additionally, any non-heir children who can earn a lot for you before they move out as a YA may do so. I suggest choosing these based on other aspects of your roll or, if you've rolled ahead of time, based on what future generations will need. - If the Generation Goal or Misc. Fun can't be done due to what you have in your city, earning the lot that you need during that generation counts as satisfying the goal even if you can't earn the lot and achieve it. If even that is impossible, reroll. Example: Your Sim is a Tattoo Addict, there is no Salon in your city, one of their kids earns a Salon before moving out and your Sim is then able to get tattoos. That would count as satisfying the goal even though they wouldn't be able to get their weekly tattoo until it's earned. - If anything is impossible or obviously unfair (like rolling photography for your first Sim, who would have to go on vacation to get a camera and then be unable to earn a community lot) you may reroll. - If your Sims have the money, you may move in an NPC at any time to use their money to buy the NPC a house of their own provided that you move them into their new home immeadiately. - All other rules in both challenges still apply. Where one rule is looser than the other, follow the stricter one. For example, the rules for this challenge state that you must start with a single Sim, while the Random Legacy rules allow you to start with a couple if you want to and have rolled for a couple. You should follow the rules for this challenge in that case because that's stricter. 2/8/2012 - Altered the requirements for unbuyable venue style lots, extended Rule #5 to include them, added info for Late Night's combined rabbitholes. 2/16/2012 - Added a new section for specific rules on moving Sims around, moved a part of rule #4 to that section. Also added a section to list mods. Also added an Optional Rules section. Expanded upon rule #6. Rules #9 and #10 were swapped with rules #11 and #12. Added rule #13. 3/2/2012 - Official update for Generations and Pets, not too many significant changes. Altered suggested requirement for the pet store. Disallowed Inheritence reward, allowed boarding schools. Added rule #14 for completeness. Added section on combining this with a Random Legacy. 1/3/2013 - Official update for Showtime, Supernatural, and Seasons. Modified Rule #13 to include daycares. Added rules #15, #16, and #17. Added optional rule #2. 12/2/2013 - Official update for University Life. Added a rule regarding the purchase of additional homes. Added rule #18. 12/27/2013 - Official update for Paradise Island and Into the Future. Added rules #19 and #20. Added alternate method for earning Beach lots. #2 8th Feb 2012 at 10:51 AM Last edited by lauratje86 : 8th Feb 2012 at 6:30 PM. I am a bit confused about how to earn new residential households though. Is there no way to introduce new, non-related sims into the neighbourhood (like there was in the Sims 2 BACC, for example). Does it rely solely on sims getting married, having children, and then the children (or ex-partners?) to move out and start their own households? If one moves one sim from a household into their own home, leaving the rest of the family in the original house, how does that work with money? Does the sim who moves out have to have the money to buy the new home or can they use the "free money" they get from moving out if you move them out through Edit Town? So if a sim can't earn a lot if they've been on holiday, does that mean that in order to unlock the WA lot types one would have to send a sim there to buy supplies (ie martial arts training equipment, camera, photography books, nectar making stuff & books) and then have another sim max the relevant skill in order to earn the lot? **EDIT** I thought of another question :-) Is it allowed to have a born-in-game child make their imaginary friend real and marry them when they grow up? I think you said that you don't have Generations, but for those of us that do this could be a good way to find a mate, especially early on in the game! **EDIT AGAIN** I've decided to start this challenge, because I failed at waiting until you'd answered my questions :-) I was too excited about getting started! I'm using an empty, flatter copy of Sunset valley which I downloaded somewhere (not MTS) - lots of space for future lots, and it's pretty too :-) My founder Jacob Wilson ordered a pizza, and pizza delivery woman Autumn Cusack has now moved in. He invents to earn money, and Autumn gardens and writes novels. Money is scarce, but I'm having fun! Jacob and Autumn had a shotgun wedding when she became pregnant. Baby George arrived not long after the wedding - right when the house had just caught fire after Jacob tried to make the stove fireproof! Jacob invented a Miner, and is now making loads of money drilling for stuff - the house how has a living room, 3 bedrooms, a bathroom and a large kitchen/diner, which means they don't all have to share one room any more! :-) George now has two toddler brothers, Patrick and David, as well as a baby sister, Andrea. Jacob and Autumn won't be having any more children. Is there no way to introduce new, non-related sims into the neighbourhood (like there was in the Sims 2 BACC, for example). Does it rely solely on sims getting married, having children, and then the children (or ex-partners?) to move out and start their own households? There are a few ways, but they're rather indirect: As you move out Sims into their own houses, story progression will take them over. If story progression causes them to die without children or otherwise leave the house empty, then story progression may cause a new family to move into the empty house. Another option if you want to take more direct charge of the situation would be to move in NPCs who aren't related, and then move them out again, providing them with a house. And if neither of the above work out for you, if enough time passes the progeny of the relatives you move out will be unrelated enough to you for you to marry them. So if you keep playing the challenge, one way or the other it will be easier for you to find mates. And it really encourages you to have big families, especially in the beginning, so that you have plenty of Sims to use in getting new residences. If one moves one sim from a household into their own home, leaving the rest of the family in the original house, how does that work with money? Does the sim who moves out have to have the money to buy the new home or can they use the "free money" they get from moving out if you move them out through Edit Town? They MUST have the money to buy the new home, and they MUST get it from the household they're moving out of. Like the name of the challenge says, nothing is free. When you're ready for a Sim to move out, I suggest telling them to move out, using that display to show you how much money they'll move out with but cancelling and then provide them a house with their moving out funds in mind, and then actually moving them into it. It can be hard earning new community lots while you also need the money for Sims to use while moving out, but that's a part of the point! Is it allowed to have a born-in-game child make their imaginary friend real and marry them when they grow up? I think you said that you don't have Generations, but for those of us that do this could be a good way to find a mate, especially early on in the game! Any way you can get a new Sim is allowed, including making an imaginary friend real. I tend to name Sims in my game based on the name of the parent whose name I didn't pick, so their kids were Duke, Lady, Princess, Duchess, and Countess. An easy way I've found for getting mates is to see if the kid who delivers the newspaper the day after they age up is the right gender, and I also know that the kid will be pretty much the same age as my Sim - they can only be friends at first, but as they grow up you can pair them off. Duke, Princess, and Countess all got their spouses that way, while Lady and Duchess were both able to snag mailmen. Lilac, like I mentioned, was a gardener so she earned me a grocery store, which was good because it let me get the produce I couldn't find around town and boosts the amount of money you make by gardening. Earl's lifetime wish was to be an illustrious author, so I had him max writing before he turned to painting for money so he got a bookstore (which is a good thing to get early on since those skilling books are very helpful). Duke, Lady, and Princess each moved out after I'd paired them off and live in a nearby trailer park. I decided to follow Duchess, so once Countess was married, she moved out with her parents and left Countess the old house. So now I'm playing Lilac and Earl, both just about ready to die of old age, Duchess and her husband Lydell, and their kids are Logan, Leslie, and one on the way. Duchess got me a diner when she maxed cooking, and her lifetime wish is to be a renaissance Sim. Her second skill will probably be gardening as I've had her help Lilac with her garden for some time so that she'll be able to keep it up when her mother passes. And as a bonus, getting the diner allows you to complete that opportunity where they can grow crazy things. Her third will probably be logic. Her husband Lydell is about to earn me a criminal warehouse, in honor of his father-in-law - just a few more skillpoints and a little more money. He also has a lifetime wish to be a renaissance Sim, but I'm not sure what I want him to skill once he's finished maxing athletics and logic. I'm still not sure what I want to do with their kids - without a school, their last two traits are always randomly picked and that can throw you for a loop. If you fail to keep the pregnant mother happy on top of that... I really want to earn a school, but you need a lot of Sims in the city before you can max charisma. So at the moment, the city consists of: two farmhouses, three trailer homes, a grocery store, a bookstore, and a diner. #4 8th Feb 2012 at 8:28 PM Last edited by lauratje86 : 9th Feb 2012 at 11:27 AM. I enjoyed reading about your family - how long have you been playing for? (in RL time and in sim time!) :-) Sounds like they're getting on well, and earning you plenty of community lots! Have you struggled a lot with the money aspect? I'm finding that very challenging, to say the least! - Small Park (Andrea) ??? #5 8th Feb 2012 at 11:32 PM Last edited by Avalikia : 9th Feb 2012 at 2:01 AM. Real time, it's been a few days. Sim time it's been, I dunno, something like 7 weeks I think? Possibly less - I'm bad at keeping track. Long enough that my starting Sim is very close to dying of old age and her fourth child is now an adult - her oldest is a child now. And yes, money is a constant struggle - that's the real challenge of it. And also why none of Duchess's siblings contributed anything - some of them maxed skills before I sent them on their way, but they didn't have enough money for both getting them a home (even a cheap trailer home!) plus a community lot. That's the reason why, as you can see, I'm in pursuit of rabbitholes - they allow either part time or full time careers which I hope will help with money. I'll playtest trying to own junkyards tonight and see what I can come up with. I'll admit that I'm not super familiar with all aspects of the venue owning system, but you should definitely be able to own a small park, shouldn't you? The fall back option would be reducing your Sim's family funds by the cost of the lot in some fashion - the familyfunds cheat or in some other way. But that's not ideal at all, so I'll see what I can find out. Okay, I looked into the problem and discovered that a little of my info is a bit out of date. Some of the Ambitions lot types and, somewhat randomly, small parks can't be purchased. Neither can generic Visitors Allowed lots (along with No Visitors Allowed lots) but I expected that. I checked all the others I'm able to get with my expansions, though, and they're buyable. But that's why I specifically stated that I'm still playtesting - this is a big challenge and if I tested all aspects of it for potential problems then it would take a very long time. I probably wouldn't have gotten around to getting a Junkyard for awhile - thanks for that! Anyway, after pondering upon the problem, I've decided that the best thing to do is make these lots you can't buy free, but be picky about what you are and aren't allowed to have in them. I wouldn't figure that Junkyards would be expensive anyways. I'll update my starting post accordingly, and also add some info for the combined rabbitholes from Late Night. It's my understanding that Generations didn't add any lot types, is that right? Also, I'd really like someone with Pets to check a few things for me: Whether or not the Equestrian Center rabbithole, as well as dog parks, cat jungles, and horse ranches are buyable, which combined rabbitholes are available with that expansion and how much each costs when buying the whole thing. #6 9th Feb 2012 at 11:25 AM Last edited by lauratje86 : 9th Feb 2012 at 5:13 PM. Awesome, thank you. Yay, my "city" (bit small for a city!) has a junkyard! :-) The only reason I went for a junkyard first is because sims can make a fair bit of money inventing - especially if they invent a Miner - and they need as much money as they can get! I used the junkyard that comes in the community lot bin - according to the info there it only cost about 3,000 simoleans anyway, so not a huge deal, I guess. And there's pretty much nothing there other than junk piles. So Small Parks can't have any skilling equipment, or a pond (makes sense!)? Just trees, other plants, tables, benches etc? So basically a spot for picnics and playing catch, yes? What about playground equipment, is that allowed? I'm heading out to run some errands in a bit, but when I get back I'll have a look at the purchasability (that's a word in my world!) of the Pets lots and the prices of the combined rabbit holes for you :-) I'm not even sure if there are any combined ones with Pets - do you know for sure that there are? I don't think that Generations added any lot types, no. I do have Generations - am I allowed to send children to boarding school? And is the Inheritance lifetime reward allowed - the one that gives the household 30,000 simoleans in return for 30,000 lifetime happiness points (all of which have to be earned by one sim, obviously)? What about the lifetime reward that allows traits to be changed, for the youngsters who didn't attend school and hence end up with 2 negative traits when they hit YA? I really want a school and a city hall! Stupid relationships requirement for the Charisma skill - apparently to reach level 10 a sim needs 25 relationships, including 10 friends. It's going to be a while before there are that many sims around in the city.... Though I've discovered that, if a sim uses the Miner (made by inventors) at night, a random homeless "neighbour" is spawned to come and complain about it. Are my sims allowed to befriend/move in/marry them or not? Which world/map are you using, by the way? Just out of interest! :-) Do you have a plan about how you want to lay your city out, or are you just doing it bit by bit, maybe starting around your founder's lot and expanding from there? - George is currently going steady with his imaginary friend Mary, and will marry her when Patrick gives him the potion to make her real. - Patrick will probably also marry his imaginary friend, Catherine, though he may marry a pizza delivery person/maid instead. - David I'm not sure about, probably a pizza delivery person/maid, if I find a nice female one! - Andrea will marry the (much older) mailman, before divorcing him when he cheats on her with David's imaginary friend, Joan, made real. - The mailman & imaginary friend Joan, eventually. Only Patrick & Catherine, David & service sim and the mailman & Joan will move out and start their own households. I intend to try and get the women pregnant before they go to ensure that there will be children. Andrea and her child/children will move out eventually, but not until George has a teenage child able to take over the garden. Obviously it's going to be hard to juggle this to make sure there are never more than 8 sims on the lot - I do have a hack to allow more, is that cheating? So Small Parks can't have any skilling equipment, or a pond (makes sense!)? Just trees, other plants, tables, benches etc? So basically a spot for picnics and playing catch, yes? What about playground equipment, is that allowed? Playground equipment would be allowed - it doesn't increase any skills. But yeah, that rule is simply to prevent people from going crazy on lots they don't have to buy. I'm not even sure if there are any combined ones with Pets - do you know for sure that there are? I do know - I believe that there's one that combines the grocery store and the diner, for example? I may be remembering that totally wrong about which are combined, but I know they exist. The easy way for you to check would be to load up Appaloosa Plains and check the Real Estate function there. Am I allowed to send children to boarding school? From what I've heard, if a child ages up at a boarding school, the trait they get is random though related to which boarding school they're at. Is that correct? If so, I see no reason not to allow boarding schools, provided that you don't intentionally avoid that. And is the Inheritance lifetime reward allowed - the one that gives the household 30,000 simoleans in return for 30,000 lifetime happiness points (all of which have to be earned by one sim, obviously)? And I believe that you're only allowed to earn that once per Sim? I see no reason not to allow that. What about the lifetime reward that allows traits to be changed, for the youngsters who didn't attend school and hence end up with 2 negative traits when they hit YA? I personally don't use that - I think that random traits are fun! But I see no reason not to allow that. All of the Pets lots (equestrian centre, dog/cat/horse parks) are purchaseable. The Petite Pony Equestrian Centre costs 115,000 simoleans. Thanks for checking! I'll add that info to my list. And do you think that the requirements I have for those lots are reasonable? They should be definitely earnable, but also a bit of work. I know! Though it's actually pretty realistic - you wouldn't expect a small town to have its own school or city hall unless it's of a certain size. And this makes you really, really, really want them, doesn't it? Though I've discovered that, if a sim uses the Miner (made by inventors) at night, a random homeless "neighbour" is spawned to come and complain about it. Are my sims allowed to befriend/move in/marry them or not? Totally fair. I believe the game will revert to using actual neighbors once you have them anyway. I am actually using Overlook Bay - it's a custom world made by LeeMortis. (I'd link you to where I found it in the Sims 3 forum, but the site seems to be down right now...) But I like it because the world is very well designed, and if you load it as a new world instead of using the saved game he provides it's totally empty - all I had to do before I started was make sure all the Community lots were marked as No Visitors Allowed - many start marked as parks and such. But I'm using his lot list as a guide for where to place everything since it makes sense once the city is built up and it saves me from having to decide. Though of course my city will end up being very different from his anyway since I'm personally building everything. I intend to try and get the women pregnant before they go to ensure that there will be children. I did that - there's pros and cons to doing so though. The pros are that your Sim's family tree continues on, while the con is that vacant houses are actually to your advantage since they can allow story progression to move more people in, so it's not a huge tragedy if someone dies childless and leaves the house available. Obviously it's going to be hard to juggle this to make sure there are never more than 8 sims on the lot - I do have a hack to allow more, is that cheating? I actually use AwesomeMod with the option to allow more than 8 Sims left on myself, though the only way I've used it thus far was in getting Duke's wife pregnant before they moved out (there were 8 Sims in the household at the time). I think that going over 8 should be allowed - it's already to your advantage to move Sims out to get more residences, and having that many Sims in a house adds to the difficulty level. Also, I should note, that the way the game divides the money when someone moves out makes having too many adults in a house a bit tricky when you decide to move anyone out. That's one thing I'm not sure if the AwesomeMod mods - the division of money when Sims move out. I know that I can use Edit Town for moving out because it doesn't give anyone extra money when I do that. But what it does (for me at least) is take the amount of cash on hand, and divide it by the number of Sims YA and older, and the number of Sims you move out each take their share with them. And the dinky trailer homes I got for Duchess's three older siblings were just over $10,000 each. So if you have 8 Sims YA and older, and you want to move just one of them out into a dinky home by themselves, you'd need over $80,000 cash on hand. If you moved 2 of them at once, you'd need over $40,000 cash on hand - just for a minimal home. That's why the three oldest all got such terrible homes - I also got the grocery store and the bookstore around the same time, so it was a juggling act making sure her siblings could move out all all. By the time Duchess and Countess were ready to split, on the other hand, Earl was pumping out masterpieces and they were rolling in money and both farm houses are pretty decent - a part of the reason why Duchess took her parents with her is because she'd get a bigger share of the money that way, though Lilac has been very helpful watching the grandkids while their parents skill and Earl keeps churning out paintings. Anyway, I'll admit that I haven't been playing my own very much because I got distracted by the Midnight Sun Challenge. I should probably attempt to juggle playing both. Though I find it hilarious that you've planned an affair and divorce so far in advance, lol. I have a fun tip though: see if you can't find a way to memorialize who earned each lot - as time passes and your city grows, it adds a sense of history to the place. Ok, this is the most interesting challenge I've seen yet. I absolutely LOVE this! Unfortunately, I've got 6 contests running right now and don't have time to really "play", but I've bookmarked this so I can come back for the rules in a few weeks and give this a go. I started playing with my founder, Ginger Evans (my first attempt at something similar to a Sims 3 Plant Sim minus the hair). Despite having no celebrity stars, three paparazzi were randomly generated onto her lot early on in the game and married one of them (Jarrett). Jarett came with a couple points in charisma, and through the use of every NPC I could find, plus Ginger and their children I'm hoping to get him to max his charisma skill and logic so I can get a school started. Ginger meanwhile has a garden, but I'm trying to focus on her writing skill so I can get a bookstore. They've had two sons so far. Aden, the oldest, just became a child and will be focusing on his gardening skill in order to get a grocery store. Boyden is still a toddler and I dunno if I'm going to skill him into anything. Ginger got to 30k lifetime points really quickly so I used that to get her the inheritance reward, and then built two 14K houses and moved in two new families (Into an empty lot, MC to add to MY active family without receiving money, and then move out via phone to the new houses). This looks like an awesome challenge! I really want to give it a go now. Great idea, Avalikia! Maybe I'll start this tomorrow. Oh, believe me I've seen worse - much, much worse. I consider this challenge to be more fun gameplay and less actual challenge. Then again, I've been playing challenges since the Sims 1 so I have a lot of experience doing crazy things to Sims. Into an empty lot, MC to add to MY active family without receiving money, and then move out via phone to the new houses. Whoa, hold on a sec! Let's be clear on this: Moving in Sims by befriending and asking to move in is perfectly okay. Bypassing the befriending process (not to mention the meeting process, which can be the hardest part sometimes) using a mod (or Edit Town for that matter) to move them in is considered cheating. It's also considered cheating to use a mod to force the game to generate new Sims for you (I don't know if you did that, what you said was unclear). Basically, any way built into the game itself to get new Sims is legit, while anything you need a mod to do is not. So it's not simply a matter of whether or not you have the money - getting the Sims to put in it somehow is a part of earning a new residence. That said, I'm impressed that you're trying to max Charisma this early on - I'm curious to see if you can pull it off. I know that the game generates enough NPCs for you to max Charisma when you build a town, but meeting all of them can be difficult. #13 10th Feb 2012 at 1:55 PM Last edited by lauratje86 : 10th Feb 2012 at 4:36 PM. Yay, more people! Thank you for all the answers, Avalikia :-) My sims are certainly going to be saving up the lifetime reward points to get the Inheritance reward! 30,000 simoleans would go a long way - especially to allow the kids to move out when they become adults. I am indeed planning things in advance at the moment - to try and get as many households as I can, but with a storyline to go with it. I'm also considering sending Jacob on holiday to France, partly to buy nectar-making stuff and fruit for Autumn to plant, and also to meet some sims there and then invite them to stay when he gets home and have them move in (and then out into new houses, when there's enough money - or they may marry/date the children when they grow up). If I do, I'll probably send him not long before he dies, as I'm focussing on earning money at the moment. The Miner's are awesome! I think that children who go to boarding school are sent home to age up, so you can pick their trait. Is that still alright? I'm not sure about that though - I've never had a child stay at boarding school until the aged up, so I don't really know how it works. I'm currently playing this, and a version of the Midnight Sun Challenge, so I'm not dedicating all my time to this one, though it's been my challenge of choice for the last few days! #14 10th Feb 2012 at 4:29 PM Last edited by ReyaD : 10th Feb 2012 at 6:41 PM. I only moved the families into mine in order to move them out again using the funds of my family, and not to have them buy the house on their own (since Twallan's mod usually pushes them into a home that has the beds/cribs they need). And by shift clicking them in my active family gains no money or relationship status. As for meeting them and causing them to become friends... one thing I've noticed is that without any community lots, the extra families tend to stay locked up in their houses, which are right next to my active lot. So by default is it really considered cheating when reasonably it wouldn't have taken any extra effort to meet them the old fashioned way? The game didn't create my new families, I did, and moved them into an empty lot across the street so they wouldn't buy the two pre-made homes I'd just plopped down for them. As for Charisma, Jarret has 17 Accquaintances and 7 friends. It may actually be possible to max charisma in gen 1 as I haven't even called over a maid/buttler/repo man yet and thats three more NPCs right there. 30,000 simoleans would go a long way - especially to allow the kids to move out when they become adults. 30,000 points can be very helpful in other ways too - that's why this is allowed. I think that children who go to boarding school are sent home to age up, so you can pick their trait. Is that still alright? How about I give you official permission to test it with one of your kids? My info says that if they stay in the boarding school that they age up there and you don't pick their trait, though if they're sent home to a place with no school I wonder what the game mechanics would make of the situation when it decides if you get to pick their trait? I'd have to disallow the boarding school until you get a school in your town if it lets you pick traits. I think that Awesomemod does change the way that money is divided up when sims move out. Well, I consider anything that mods how the money is divided as fine. It's whether or not you dodge the game giving you free money that matters. I should probably add a listing of which mod effects are and aren't okay to the original post, but I'll do that later when I have the time to reread everything we've already talked about. I may steal your method as a suggestion for modless users. Given how expansive the AwesomeMod is, I wouldn't recommend downloading it for any one thing - though I do highly recommend it for its combined positive effects. As for meeting them and causing them to become friends... one thing I've noticed is that without any community lots, the extra families tend to stay locked up in their houses, which are right next to my active lot. So by default is it really considered cheating when reasonably it wouldn't have taken any extra effort to meet them the old fashioned way? It would have taken extra effort, as getting one of your Sims over there to talk to them and befriending them takes time out of their day which could have been used for skilling, and it takes effort on your part as a player to supervise the socializing to make sure it goes well. Just because it isn't hard, doesn't mean it's no extra effort. You may make 1 CAS Sim in this world, and 1 only. It may actually be possible to max charisma in gen 1 as I haven't even called over a maid/buttler/repo man yet and thats three more NPCs right there. Oh, I know it's possible, but it's also very difficult. Would a mod that allows near relative relations allowed. So that cousins could marry instead of only second or third cousins. Also, as long as the house they live in is house that has everything the family needs am I allowed to switch active families and am I allowed to switch back to the original family? Hmm, I think that allowing first cousin marriage would make this too easy - it's very easy to directly make a Sim's siblings have kids by making them pregnant before you move them into their own house. Which means that Sim's kids would have no problem finding a cousin to marry. So no. And yes, as long as your Sims are in actual houses, you can freely switch around to other households whenever you want. #18 11th Feb 2012 at 11:55 AM Last edited by lauratje86 : 11th Feb 2012 at 4:02 PM. Yes, that's true - that's probably why I didn't think about the inheritance until recently. Both Jacob and Autumn have earned more than enough points to get the inheritance, but they spent them all on other stuff - fast learner, better prices for inventions and fireproof homestead, mainly. I'm hoping that each child will earn the Inheritance reward before they move out - that'll allow them to get a decent house (with cribs and enough beds, so that Twallan's SP will let them have babies without them wanting to move house) and leave some money available for buying community lots. Okay, cool. I'm going to try this one as soon as I'm not doped up on meds and able to focus on more than one thing at a time. #20 11th Feb 2012 at 4:49 PM Last edited by lauratje86 : 11th Feb 2012 at 11:29 PM. So much for my cunning plan! I forgot that I had a risky Woohoo mod installed, which replaces Woohoo with Risky Woohoo, and now Autumn is pregnant, when she should've been aging up to elder! Ooopsie baby on its way! :-) When the baby's been born Jacob and Autumn are off to France to meet some new people, as well as buying grapes and other fruits for Autumn's garden and nectar making equipment and books.... Jacob is an elder now, and Autumn will age up as soon as the baby's been born. George will become a YA later today, and Andrea will become a teen. **EDIT** Baby Edward has been welcomed to the Wilson family - even though he was completely unplanned! Autumn is now an elder, and she and Jacob just got back from a holiday in France. They found lots of gems and things whilst they were there, and made about 30,000 simoleans from them! Jacob has invited his friend Napoleon to visit, and may ask him to move to Sunset Valley - if he does, he'll probably bring his wife over as well. George is now a young adult, and is looking forward to marrying childhood sweetheart and imaginary friend Mary. Andrea is a teen, and is considering getting a job at her Mum's grocery store. Patrick will age up in a few days, and can't wait to move out into his own place - probably with imaginary-friend-soon-to-be-made-real Catherine. **EDIT AGAIN** George is now married to the no-longer-imaginary Mary, Patrick is an adult and is in a relationship with his no-longer-imaginary Catherine. They, and Max, will be moving out to their own place soon, but I think that I may get her pregnant first. Catherine is ok looking, Mary is quite pretty. I love her hair colour. They both have nice eyes - I like getting some unusual genes in without having to make weird-looking humans. Jacob maxed handiness, which got him enough lifetime aspiration points to get an Inheritance - George now owns a bookstore, and there's plenty of money for Patrick and Catherine to get themselves a nice new home! Well, seeing as I've already broken the rules I guess I'm out lol. But I did fall in love with this challenge so I hope you don't mind me continuing with just that rule edited out. Hey, taking a challenge and tweaking the rules just a little just to suit your tastes is tradition! Just so long as you don't claim that you're doing it perfectly right. But I'm really glad that you've taken it up and are continuing on anyway - I just might have followed the links in your sig and become a fan of your stories... And I think it's awesome to have someone writing a story based on my challenge! #24 13th Feb 2012 at 12:43 PM Last edited by Klevkin : 13th Feb 2012 at 3:49 PM. Rofl, cece, since when are you ruled out when you break a rule? I think you should continue and just go like, hey made a mistake! I've emptied out Hidden Springs for this, realizing one thing though, all those community lots like school and city hall, how are you going to build those back? I am not that familiar with the possibilities of real estate, never explored that feature, but are you allowed to build all of those through the venue menu?? I'm also tweaking it a bit, my starter sim is the main character of my random legacy, and I want him to marry the sim from cece's random legacy (they are sort of made for each so there is actually no way the watcher (sorry cece :P) will let him get offspring), so I am not technically creating another sim in CAS or adding it to the world. What I am going to do is replace one of the NPC sims with her, so actually, it changes nothing in the challenge, won't make it easier or give me an advantage, just that I get to start out with the couple i want . Once you're on an empty community lot of whatever size you can pick one of the rabbit hole buildings and plop it down wherever you'd like. That's all it takes.